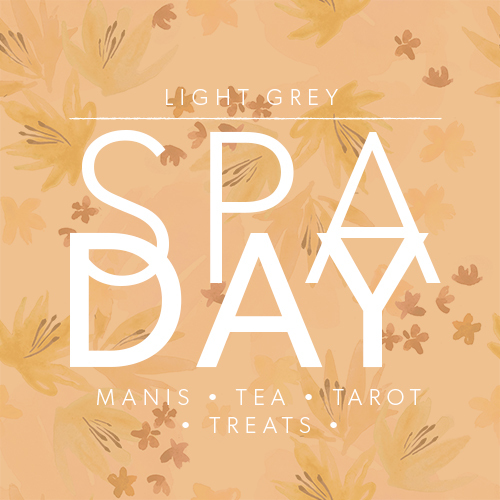 LIGHT GREY ART LAB: Spa Day at Light Grey! Spa Day at Light Grey! Stop by Light Grey Art Lab this Saturday from 12:30-3:00pm for Spa Day! We could not be more excited about this event, and want to invite you all to a day of relaxation, pampering, and refreshments! Laurel Maha from PizzaPerfectNails.tumblr.com is coming all the way from San Francisco to give darling and unique manicures! We'll be taking reservations for manis for anyone interested starting at 12:30 that day, so just stop by and sign up! We'll also have a couple fun things to do while you're waiting for your manicure- Come sit down for a relaxing tea ceremony, receive an insightful Tarot Card reading, and enjoy some company and snacks! We may even lead a small 1/2 hour yoga/meditation class for those that are interested, so if you'd like to join in, wear something comfortable! This event is free and open to all! Feel free to invite friends. You can check out more information and RSVP on the Spa Day Facebook Event page here! Laurel Maha is a nail artist and designer. She combines fun patterns, geometric shapes, abstract images, typography, and three dimensional pieces to create unique, beautiful, and one-of-a kind nail designs. She paints for all types of people, giving them a fresh and self expressive nail art. Laurel recently founded Pizza Perfect Nails, and is currently biking across the US as she paints nails, meets new people, and shares her passion for nail art. You can check out more information about Pizza Perfect on her tumblr page here! This is an old post but still interesting. I am reading more post on your blog, Jenny ! Your at-home spa day is complete! You should be glowing from head to toe and feeling pretty incredible right about now. Feel free to make this a weekly thing. You won’t mind! I like articles, i will share it. Sometimes we made the silly mistake with our cars like We have a habit of using lower and mixed quality gasoline in our car because of those stupid offers and discounts that are also harmful to the car engine. So, cleaning the driver is mandatory. To clean the engine suitably and efficiently, the importance of fuel injector cleaners is unimaginable. If you are looking for this, you can visit here.